Cholesterol has been the so called “big baddy” on the health scene for several decades, with the mainstream media and the medical profession alike urging you to cut back on animal fat and switch to low fat products in order to lower your cholesterol – while at the same time taking prescription statins. In fact, the exact opposite is the way to go as one of the best ways to raise your HDL cholesterol is to consume more dietary fats, including healthy saturated fat such as coconut oil, butter, cream and full-fat meats, as well as mono-unsaturated fats like avocados and olive oil. Consuming a high-fat diet provides your body with the raw materials for making HDL while eliminating any so called necessity for taking prescription statins. How many are taking statins? At the moment, these cholesterol-reducing statins are prescribed to 7 million people in the UK and 15 million in the USA. Of course, Big Pharma is anxious to increase these numbers even further. They would love statins to be handed out much more freely – as a preventative before people have even been tested to show higher cholesterol levels – just like giving out candy, without any thought as to the significant side effects suffered by many. 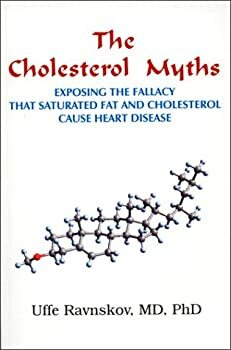 Anyone who has been persuaded to become afraid of high cholesterol would do well to read the work of Uffe Ravnskov, MD, PhD, author of “The Cholesterol Myths : Exposing the Fallacy that Saturated Fat and Cholesterol Cause Heart Disease”. 1. Cholesterol is not a deadly poison, but a substance that you need to be healthy. High cholesterol itself does not cause heart disease. 2. People who have low blood cholesterol have the same rates of heart disease as people who have high blood cholesterol. 3. The cholesterol found in your blood comes from two sources: cholesterol in food that you eat and cholesterol that your liver makes from other nutrients. The amount of cholesterol that your liver produces varies according to how much cholesterol you eat. If you eat a lot of cholesterol, your liver produces less. If you don’t eat much cholesterol, your liver produces more. This is why a low cholesterol diet does not typically decrease a person’s blood cholesterol by more than a few percent. 4. Drugs that solely lower your cholesterol do not decrease your risk of dying from heart disease, nor do they increase your lifespan. These drugs pose dangers to your health and may decrease your lifespan. 5. While statins do reduce your risk of heart disease, it is actually through mechanisms that are not related to lower blood cholesterol. And alarmingly, statins like lipitor, mevacor, zocor, pravachol, and lescol are known to stimulate cancer in rodents. One important point to remember about cholesterol is that we all need sufficient levels to enable our brains to function properly. Cholesterol is a major constituent of the human brain, and the brain is the most cholesterol-rich organ. Cholesterol is tightly regulated between the major brain cells and is essential for normal brain development. Based on this, I have my own theory about one of the possible consequences of people going all out to lower their cholesterol. I have started to wonder whether all this lowering of cholesterol levels could be linked to the growth of Alzheimer’s and other dementia? What happened when a doctor stopped taking statins after 8 years? There is an interesting story in The Telegraph newspaper this week about a doctor who tells how when he had a routine health check-up eight years ago, his cholesterol was twice the recommended maximum. His own doctor instantly prescribed statins and for those next eight years, he faithfully took his 20mg atorvastatin pills – and without any side effects. When he informed his doctor three months later, he wasn’t entirely honest, saying he’d quit the drugs because they were causing pain in his arm. Many studies have found that one in five people on statins suffers adverse side effects, from muscle pain and diarrhoea to memory loss and blurred vision. His doctor then suggested he should try another brand. But the patient asked for a blood test first. When the results came back, his doctor was amazed that his total blood cholesterol was lower than when he’d been on statins. The only major changes he’d made to his lifestyle since coming off the statins were to eliminate all sugar (including alcohol and starchy foods such as bread) and to eat more animal fat. 7 months later, and his levels remain the same. In fact all of his tests had improved beyond recognition so that biochemically, he was in excellent shape. He is now deeply concerned about proposals advising even wider use of statins. In the UK and until 2005, statins were prescribed only to those with at least a thirty per cent or greater risk of having a heart attack within ten years. This was then reduced to a twenty per cent risk. Now, draft NHS guidelines are advocating giving statins out to those with just a ten per cent risk — that is most men over the age of fifty and most women over the age of sixty. And sadly, the majority of people will go along with such a recommendation…like giving candy to a baby.